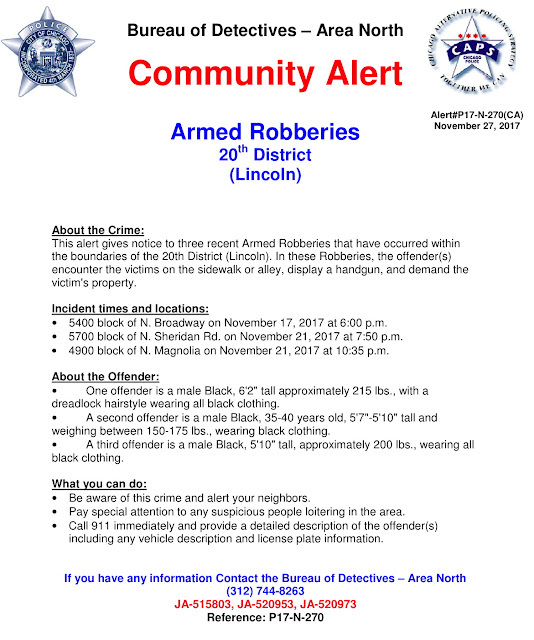 Police this afternoon issued a community alert after detectives connected three recent robberies in the Uptown and Edgewater neighborhoods. In each case, one or two robbers have approached people on the street or in an alley and demanded valuables at gunpoint. 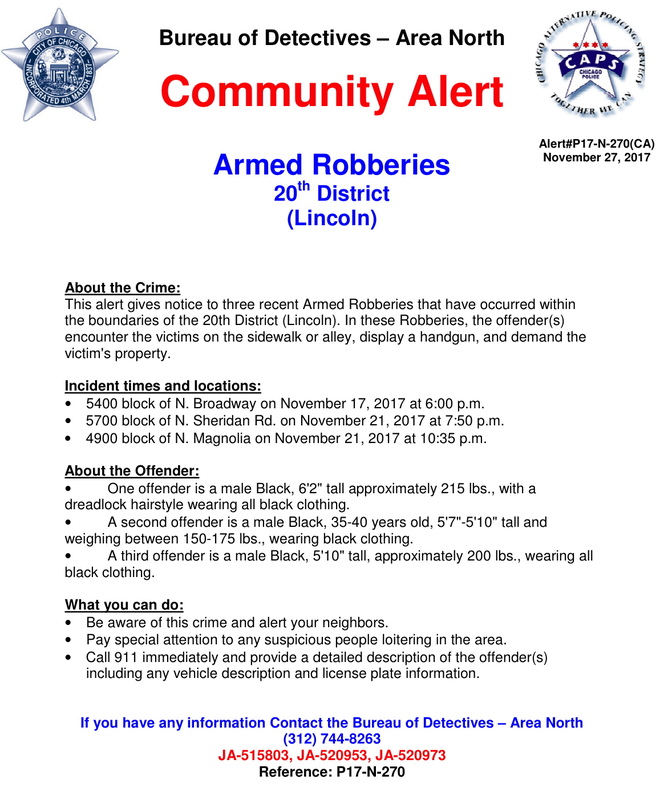 • Around 6 p.m. on November 17, two men approached a man in the 5400 block of North Broadway. They took the victim’s wallet, ID, and money then fled across Broadway and ran through a parking lot. One offender was described as black with dreadlocks, 6’2” tall, 215 pounds, wearing a dark hoodie and light jeans. He was armed with a handgun. The second man was black, 5’10” tall, 150-175 pounds. He wore a dark hoodie with jeans. • Around 7:50 p.m. last Tuesday, an elderly couple was approached by a gunman as they unloaded groceries behind a condo complex in the 5700 block of North Sheridan Road. The victims had nothing of value to offer and the gunman fled empty-handed. Police said the gunman is black, 35-45 years old, slender, with slight facial hair and dark clothing. • Then, around 10:35 p.m. last Tuesday, another man was approached by a gunman in the 4900 block of North Magnolia in Uptown. The victim told police that the offender demanded property, “said something about gay people,” and made him walk for about a block before telling him to run away. The victim said the offender was a black man with a scruffy beard, about 6-feet tall, who was wearing a dark hoodie. Police are advising residents to pay particular attention to suspicious people who appear to be loitering.